Welcome to College Try! This is a BRAND NEW series where we DIY with less power tools! No drill? No problem! This series is all about achieving your DIY goals without expensive tools, complicated materials, or breaking the bank. We’re giving your DIYs the ol’ College Try! Today we are tackling the headboard! We are going to be showing you guys three ways to anchor your bed in your room while also adding SO many style points. Let’s get started! 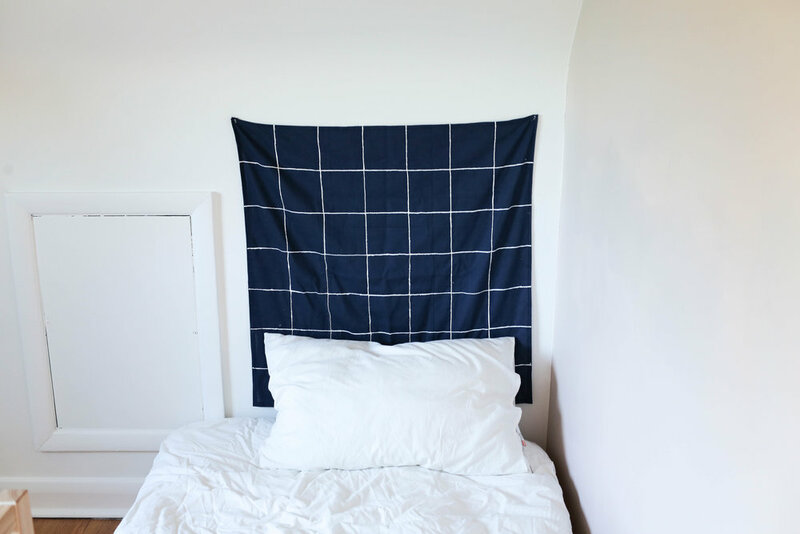 This first DIY is this really awesome but modern DIY tapestry-inspired headboard! You are going to start by heading to the dollar or thrift store and finding a bed sheet or pillowcase in your desired colour! Lay out your sheet and give it a bit of an iron if it is wrinkled. A good tip if you don’t have an iron or steamer, hang the fabric up in your bathroom the next time you are taking a shower! The steam should loosen up most of the wrinkles in your fabric. Go ahead and lay out your fabric and use your fabric measuring tape and measure out the size of the space above your dorm bed (or whatever size you’d like it to be). Ours ended up being 35 inches by 35 inches. An easy way to cut out a square is to find your measurements from each side, then fold the corner of your fabric in to line up to where you marked your side measurements. This gives you a guide for cutting! Our next step is to add a hem! Since we don’t have a sewing machine, and hand sewing would take forever, we are going to use a glue gun to hem the edges. Simply add a small line of glue to the edge and fold over to seal! Time to add the grid. Now, this math is going to depend on the size of your headboard. To add an even grid, measure the length of your headboard (with the new hemmed sides) and try dividing that number by the amount of lines you think you might want to go across your fabric. The larger the number you divide your length and width by, the smaller your grid will be. We honestly just played around with the numbers until we got something we liked! Mark off those measurements and create a grid using a ruler and a white pencil crayon or piece of chalk. Once marked off, go ahead and go over all of your lines using some white puffy paint! Once everything is dry, time to hang! Just go ahead and add two tiny holes in the top two corners of the headboard and use removable sticky hooks to hang! Next up, we are going to be making this gorgeous ombre floral headboard! We ran over to the dollar store and picked up flowers from the dollar store that were in the same colour family as well as were similar in size. We started by taking all of the flowers off of their stems. Next, we went ahead and layed out the flowers in four rows in a pattern so that we have an idea of what our headboard is going to look like. Next, we took some fishing wire and glued the flowers one-by-one onto the string. You can find fishing wire at the dollar store, but if you can’t find it, a thin twine would look super cute too. We used a glue gun to do this. Once those are glued into place, you’re all done! Just add some sticky hooks to the wall and create little loops in the tops of the fishing wire to hang the flowers onto the hooks! Finally, we are going to be recreating this really cool woven headboard that we made on our channel before, but this time a lot easier! We started with this really cool metal frame that we found at the thrift store. We took it apart, taking out the print and the glass. Next, we grabbed some faux leather. You can find this stuff at a fabric store. We went ahead and cut our leather into strips. Cut enough strips to cover half of the frame width and length-wise. We are going to need strips that are the length of the headboard (+ a little extra to wrap around the wood) both vertically and horizontally. To add the strips to the frame, we went ahead and spaces them out evenly on the frame, wrapped them around the back of the frame, and used hot glue to hold the leather in place. Once all of the horizontal strips are in place, we added the vertical strips, and weaved them through the horizontal, alternating where the weave started with each strip. To add it to your wall, simply add some sticky hooks to your wall and hang your frame! And that’s it! If you make any of these headboards be sure to tag us on instagram using the hashtag #SorryGirlsSquad so that we can see! Also be sure to check out the video below for more! Thanks for reading! UMMMM... turns out making all of your fave summer jewelry trends out of jump rings is super easy!? These letter boards are super popular and you best believe we are going to show you how to DIY them Sorry Girls style!